The Present work, a revised , re set and Expanded edition of the 1978 classic Presents 27 articles contributed by Research scholars of established merit. 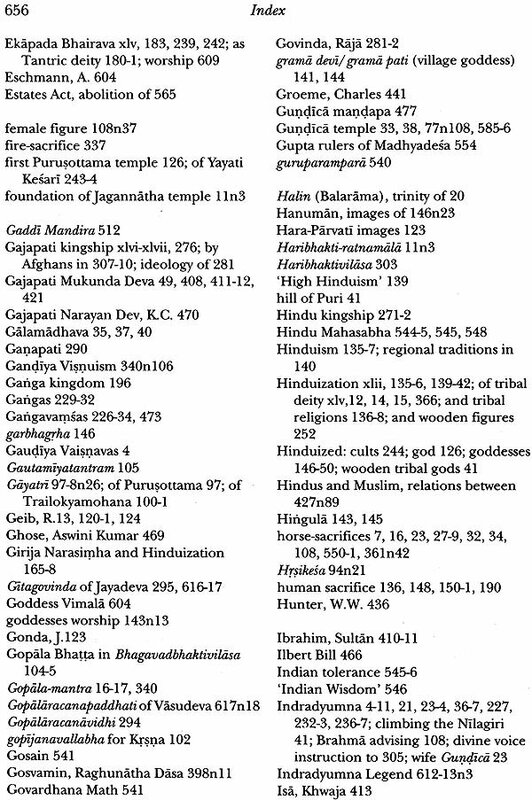 It Deals with a comparatively less studied aspect of Indian culture, namely, the role And significance of regional Hindu Tradtions that emerged at the beginning of the early medieval period out of an interaction of elements of classical Hinduism with autochthonous local Religious practices and beliefs. Among The regional traditions the cult of Jagannatha in Odisha is most Interesting because of its archaic character as well as uninterrupted development until today. The cult is verily a culture and the backbone of Odishan identity. Some of the earlier essays have been Revised and three new added: two on Temple legend by G.C. 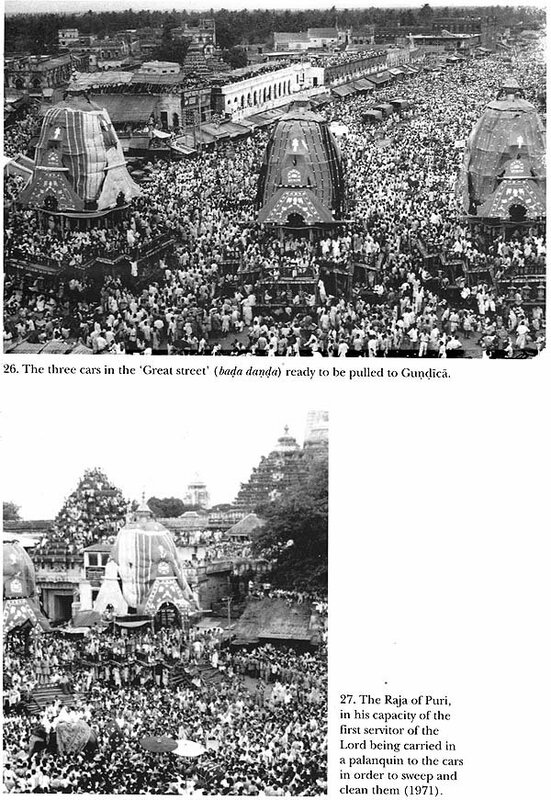 Tripathi and Ruprect Geib and One on Pilgrimage to Jagannatha by Jacob A. Rosel. All the articles treat various topics pertaining to Jagannatha and the Hindu tradition of Odisha in a coherent and mutually connected manner. Anncharlott Eschmann (1941-77), studied in Munich, Marburg and Heidelberg; Dr. Phil in Comparative Religion on the Concept of History of the Aztecs (1970), Senior Research Fellow, Orissa Research Project, Assistant Prof. South Asia Institute, Heidelberg (1970-5); field studies' in Orissa 1970-1, 1974, 1976-7, Representative of the South Asia Institute at New Delhi 1975-7. Specialization: Comparative Religion with special reference to India and Mezzo-America. Hermann Kulke, born 1938, Ph.D. in Indology on the temple city of Chidambaram (Freiburg 1967), D. Litt. 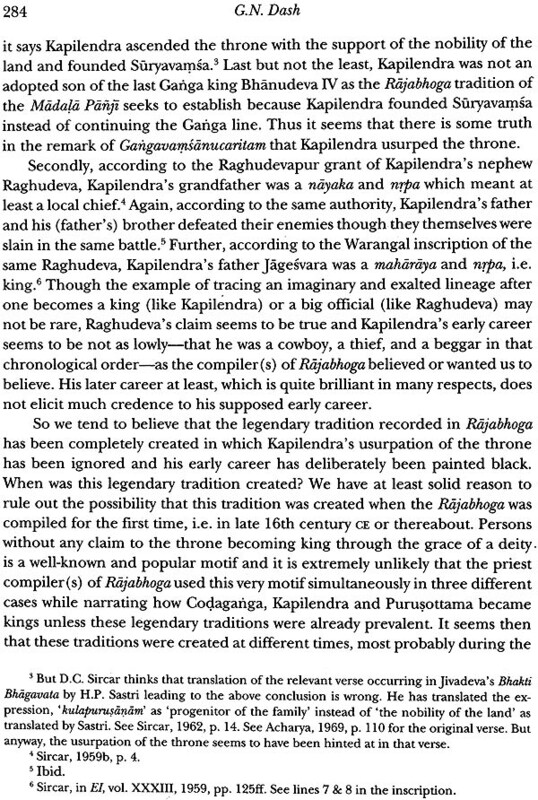 (Habilitation) on Gajpati kingship and Jaqannatha cult (Heidelberg 1975). Professor of Indian History at the South Asia Institute, Heidelberg University (1967-88) and Kiel University (1988- 2003). Currently coordinator of the second Orissa Research Project (1999- 2005). Specialization: South and Southeast Asian History, Historiography and Orissan studies. 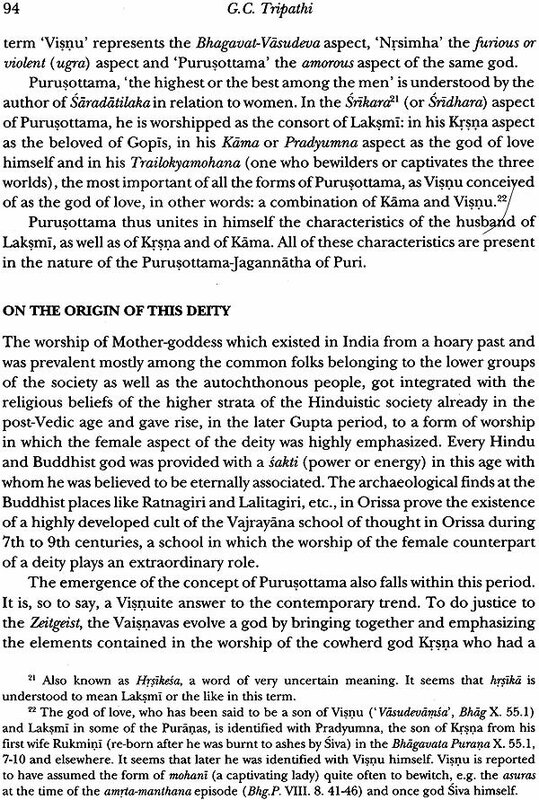 Gaya Charan Tripathi, born 1939, Ph.D. from Agra on the Origin and Development of Vedic Pantheon (1962), Dr. Phil. from Freiburg on the Legend of the Dwarf Incarnation of Visnu (1966); D.Litt. 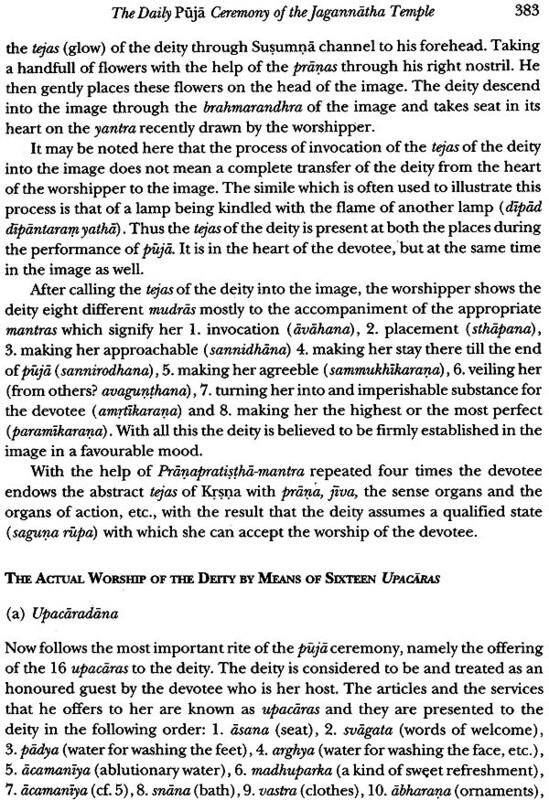 Allahabad University on the Daily Puja Ceremonies of the Jaqannatha Temple. Field Director of the first Orissa Research Project (1970-3), Principal, G.N. Jha Kendriya Sanskrit Vidyapeeth (1977-2001). Professor and Head of the Kalakosh Division, Indira Gandhi National Centre for the Arts, Delhi. Director, S.L. Institute of Indology, Delhi. 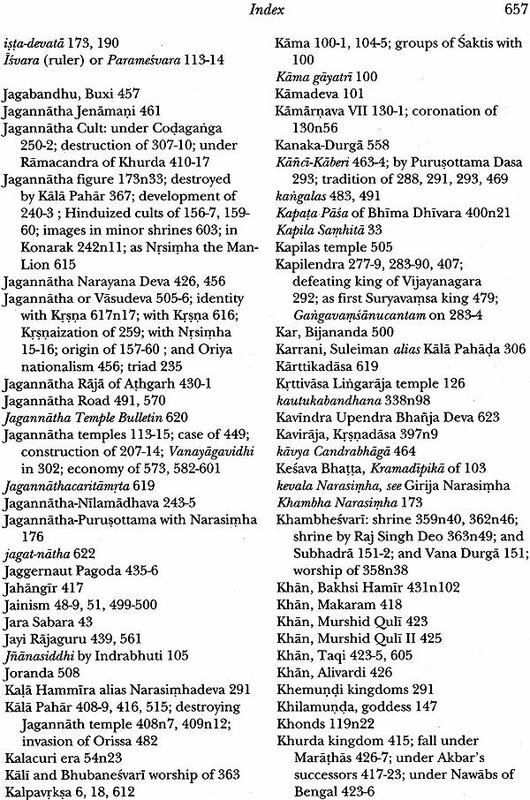 Specialization: Vedic and Classical Sanskrit, Puranas, Ritual, Textual Criticism and Orissan studies. 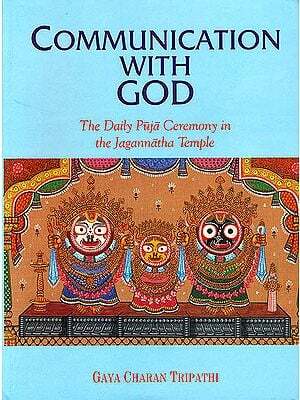 It is a matter of great satisfaction for us to see The Cult of Jagannath and the Regional Tradition of Orissa, I being issued in an enlarged and revised edition after nearly thirty-five years of its first publication and we are immensely grateful to the Providence which has allowed us not only to witness its growing popularity and its academic importance over these years through several reprints, but has also spared us so long as to be able to edit it afresh, to enrich it with a few important additions and to offer it to our readers in this beautiful, new avatara, having made it cast aside its previous modest corporeal frame. 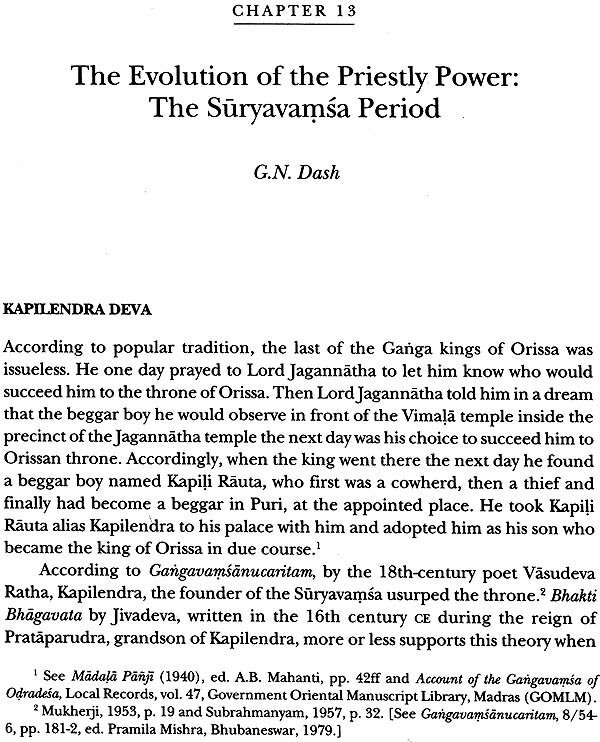 The work was originally conceived as a joint publication of the members of a multi-disciplinary first Orissa Research Project (1970-75) sponsored by the German Research Council (DFG) and contains in form of relatively short articles their initial findings on different facets of Odishan Religion, Society and Culture. While the first edition of the present work was inscribed to the memory of our dear colleague Dr. Anncharlott Eschmann, the third of the editorial 'trio', who unfortunately had passed away while the work was in progress, the occasion and the timings of the release of this revised and enlarged edition of the same brings back strong memories of our revered Guru and mentor at Freiburg University, Prof. Ulrich Schneider (1925-92), who was the Director of the first phase (1970-75) of the Orissa Research Project, the findings of which period are mainly embedded in this book. Hereby we wish to gratefully record our deep gratitude to him. 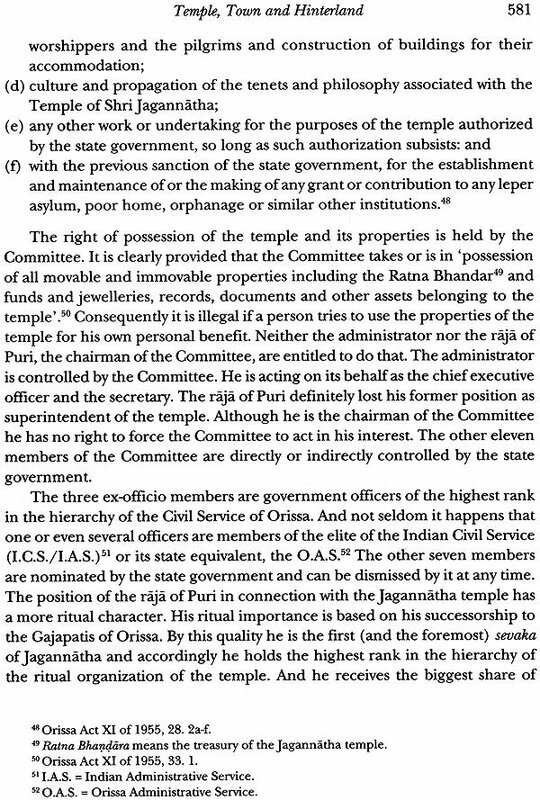 The majority of these articles rally most naturally around the towering persona of Lord Jagannatha who registers his ubiquitous presence in all aspects of Od ish an history, culture, society, religion and politics-to name only the few. 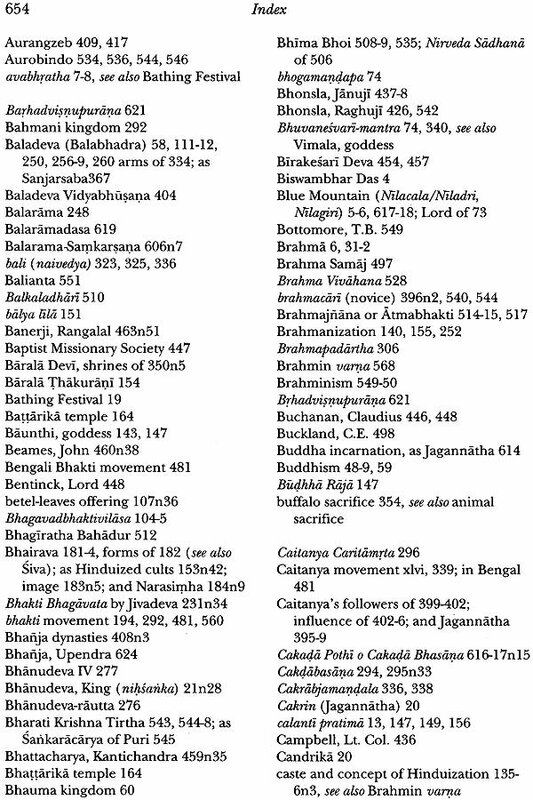 The subsequent attempts, however, of the scholars of the follow-up Projects-available in form of monographs or collective articles-have ventured to look beyond this epicentre of culture and power, that is Puri, and have tried to bring to fore the specific contributions of regional units and the 'minor' ethnic as well as religious groups which have gone into making of this whole complex of cultural phenomenon which forms the specific identity of Odisha. 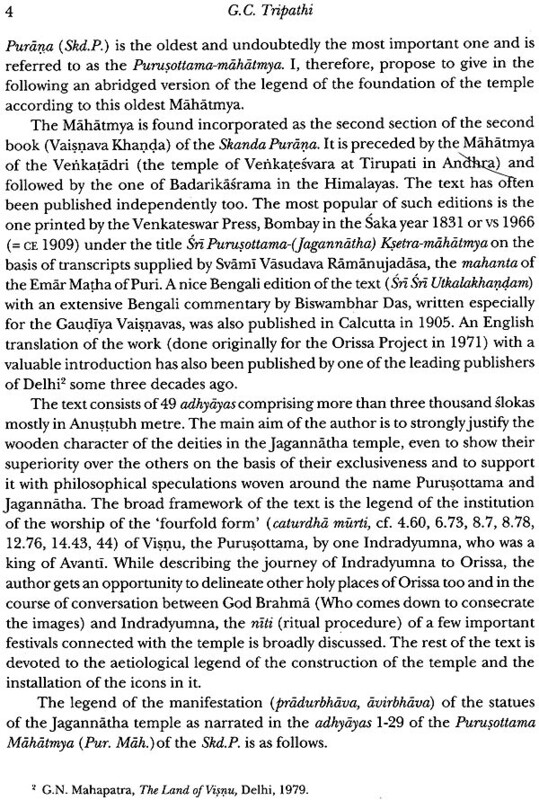 Present work, which appeared first in 1978, generated-quite unexpectedly-unprecedented interest in Odishan studies and the scholars suddenly realised that this far-flung eastern state of India, which was considered as a kind of 'hinterland' of the subcontinent had a strong regional identity of its own and had much to offer to the scholars of a number of disciplines in terms of scientific studies of the various aspects of its history and culture. 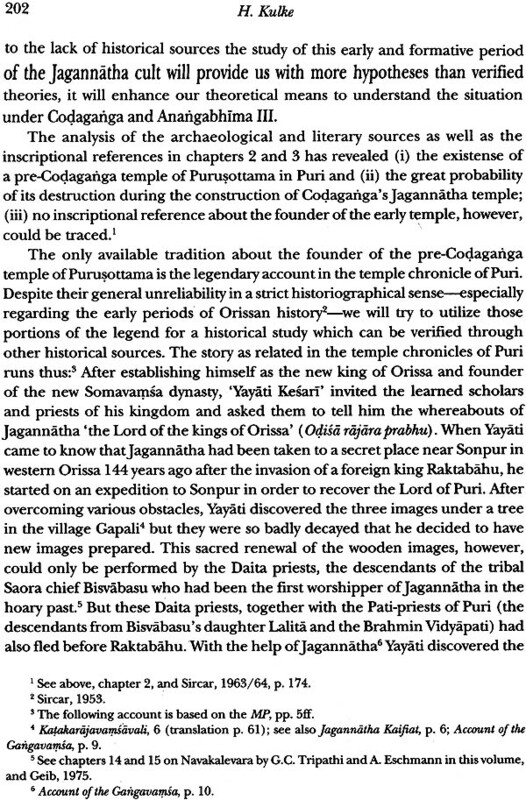 The work also went a long way to lend a scientific temper to the studies of the Odishan scholars themselves on Jagannatha and his cult which were, partly at least, confined and constricted to the traditional accounts till then. In order to take a kind of inventory of the new contributions on Odishan studies and to come in to closer con tact with the 'newly gained' lovers of Odishan studies, a conference was organized, two decades thereafter, in 1997 by H. Kulke and B. Schnepel at the South Asia Institute of the University of Heidelberg, the proceedings of which were published under the title Jagannatha Revisited: Studying Society, Religion and State in Orissa (Manohar, 2001; vol. 1 of the series 'Studies in Orissan Society, Culture and History'). Scholars assembled felt that the time had come when one should take a re-look at the Odishan studies, evolve new perspectives and shift its focus to the other unexplored areas of this culture. The idea of a second Orissa Research Project (ORP) was born. The Project was sanctioned by the German Research Council in 1999 under the title: 'Various Identities: Socio-Cultural Profiles of Orissa in Historical and Regional Perspectives' and lasted till 2005. The team of scholars included some members of the first ORP along with a sizeable number of new scholars. Whereas me first ORP focussed on me curt or jagannatna and me temple city of Puri and the dominant discourses of coastal Odisha, the second project sought to delve deeper into the inherent vitality and dynamics of India's regional traditions by paradigmatic studies on the genesis, historical development, contestation and integration of various sub-regional traditions of the hinterland." 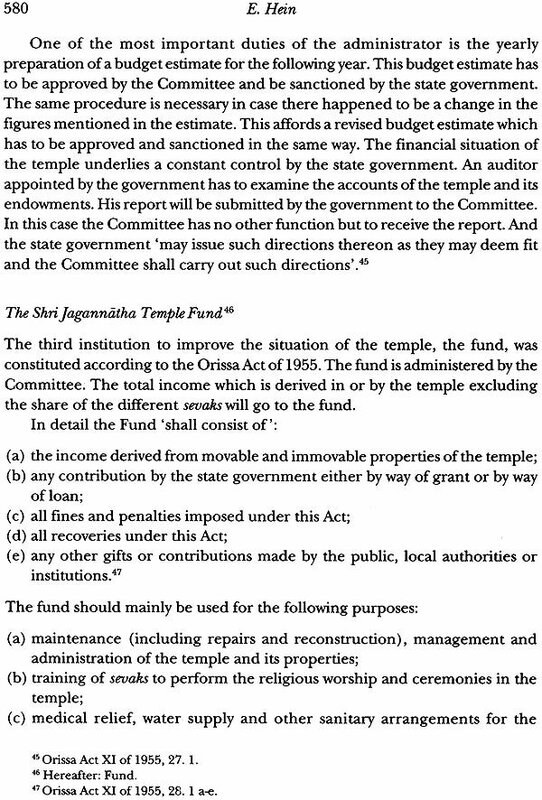 However in spite of this clear shift of emphasis, or perhaps precisely due to that, the plan to re-edit this first collection of papers on the Cult ofJagannath was appreciated and considered highly desirable not only by those members of the first ORP, who were still associated with the second ORP, but also by its new entrants, since the anthology had acquired a sort of 'classic' status by this time, being a pioneer study of its own kind, and had inspired quite a few similar studies on other religious kshetras. The present revised edition is an outcome of this very desire of the members and, honestly speaking, also of its persistent demand as a recommended reading in many universities. Before the volume went to Press, available authors were given choice to edit or improve their contributions. C.N. Dash practically re-wrote some of his papers. C.C. Tripathi went through his and H. von Stietencron's papers carefully. H. Kulke did the same with his papers. Thereafter the typeset copy of the whole work was twice subjected to a careful scrutiny by us, the two editors. The present edition is enlarged with the addition of two new articles, the absence of which was painfully felt by the readers; further an updated new Bibliography of monographs and papers related to the themes discussed in the volume which have appeared since 1978 has been added and attention of the scholars is being drawn in this introduction to some significant new research in the areas concerned. Further, the language of the volume has been carefully edited by a competent copy-editor which has not only removed certain 'Germanisms' and 'Indianisms' of the authors present in previous volume, but has also smoothened out the language and made it, to a certain extent, uniform. Besides all this, the high standard of production and especially a significantly improved quality of illustrations at the end is a matter of great satisfaction to us. The inclusion of the two new articles has been overdue since long as the absence of their themes, firstly the Indradyumna legend containing the aetiological account of the 'origin' of the Deity Jagannatha and the establishment of his first temple by a king of Malwa, and secondly, the organization of pilgrimage to the temples and the town of Puri were felt as deplorable lacunae in the first edition. The text-critical study of the Indradyumna legend based on Odia texts of medieval ages has been the subject of D.Litt. thesis (Habilitation) of R. Geib which was already published in German in 1975,3 but for personal reasons, he was unable to contribute an article on it. Fortunately, however, a kind of preliminary summary of this work in English, meant for a report submitted to the DFG, was available with us. It has been edited by G.C. 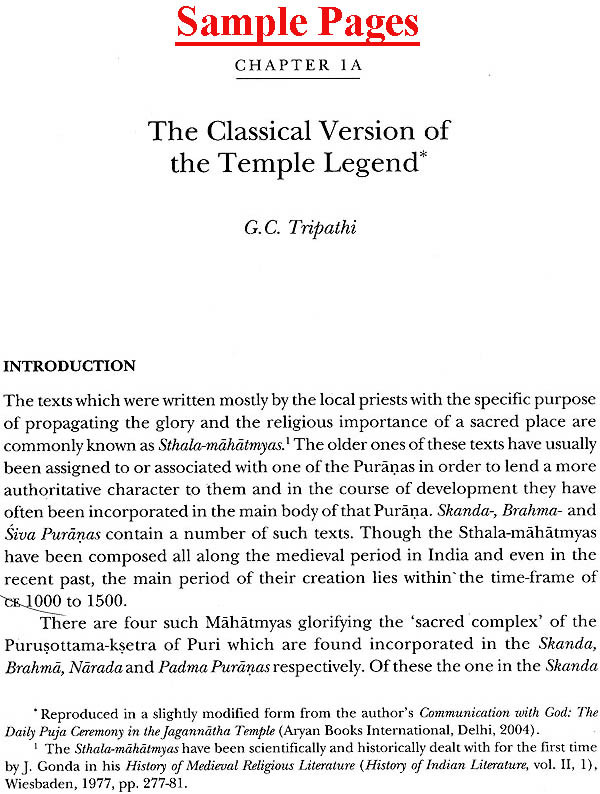 Tripathi, turned into the format of a paper and he added to it, further, the classical version of the legend in Sanskrit as mainly found in the Purushottama Mahatmya of the Skanda Purana thus paving ground for an interesting comparative study of priestly Brahmanic version of the legend with the folk versions of the Odia poets which were prevalent among the common people during fifteenth to eighteenth centuries. The readers will also welcome the fascinating study of J.Rosel on pilgrims and their 'care takers' (the Pandas) to the Temple town of Puri, the relationship between the two and the plight of the pilgrims once they land in the town. His description is very authentic and is based on first-hand knowledge since he stayed for months in the shelters (dharmashalas) made for pilgrims, interacted with the Pandas and observed the system very closely. This important theme of the organization of the pilgrimage was missing in the first edition as J.Rosel was not supposed to publish an article on this subject before submitting his Ph.D. thesis which dealt with this very subject." We are thankful to him for taking a second chance after thirty-five years! Already in 1997, during the preparation of the 'Jagannath Revisited' Conference at Heidelberg, we were surprised and delighted by the tremendous proliferation of Jagannatha research during the preceding twenty years, a development that continues unabated till today as attested and put on record by the new Bibliography." 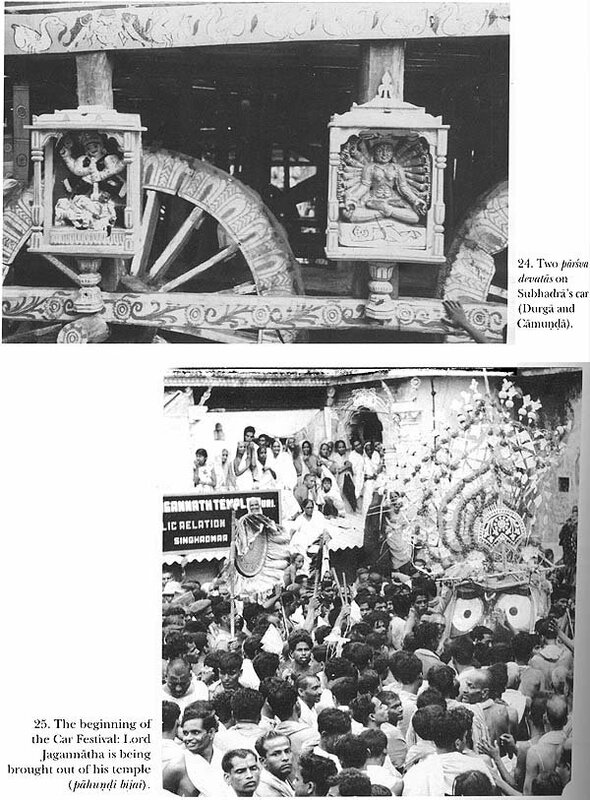 The overwhelming majority, particularly of the monographs, however, still belongs to the traditional 'Odia School', focussing around the greatness of Jagannatha and His cult, keeping Him at the centre of Odishan history and depicting him not only as a marked symbol of Odisha's identity but also the apogee of its culture. They are in a way, a kind of modern Sthala-Mahatmyas and consider Jagannatha's hegemony as a major prop of contemporary Odia identity. 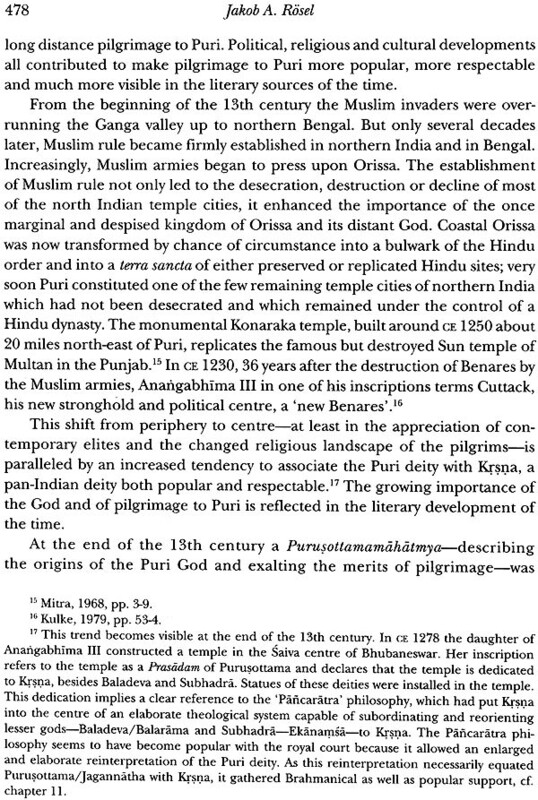 It may however, be mentioned in passing that in contrast to the influence of the jagannatha cult on the rise of Odishan ‘ nationalism’ in the late nineteenth century ( see below), a comprehensive study of Jagannatha’s impact on contemporary Odisha is still missing. 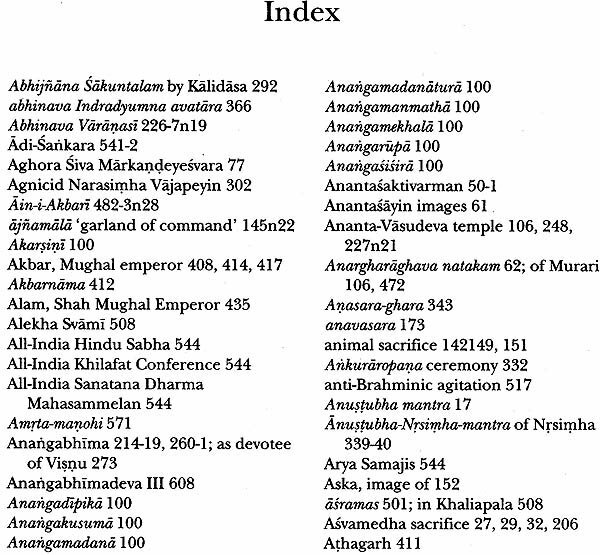 During the last one and a half century, Indology, both in India and in western Countries, has produced innumerable contributions to our knowledge of the great all-Indian Sanskrit tradition. Social anthropologists, on the other hand, have concentrated their painstaking field work on India's villages, tribes and, more recently, on urban problems of modern India. Both disciplines thus have mainly concentrated their research on the 'outer portions' of the continual spectrum of India's tradition, i.e. its local and all-India aspects. Till recently both disciplines have tended to avoid the various regional traditions of the South asian subcontinent, although they form literally not only the 'central portion' of India's tradition, but also the true melting pot of local and all-Indian traditions. This trend may be partly due to the vague feeling that the regional traditions represent neither the 'unspoiled' Sanskrit tradition nor the pure village life, but a distorted 'provincial' variant of both. The neglect of India's regional traditions has also been due to the fact that they obviously had fallen between the chairs of sociological and philological disciplines. This has further been caused by a gap in the chronological order between the respective fields of research of he two disciplines. Whereas the Indological field had seldom transgressed he post-Gupta period, the sources of research of social anthropologists and sociologists usually do not go back beyond the 19th century. However, it was exactly this period of about one millennium, roughly between the eighth and he 18th century, during which the regional traditions of India developed their distinct premodern characteristics. The present state of our knowledge about these traditions is, therefore, still quite contrary to their actual importance for the cultural development of India. For the last nearly thirty years two concepts have contributed substantially towards a more differentiated analysis of the social organization of Indian tradition, i.e. Redfield's concepts of 'the great and the little tradition' and Srinivas' concept of 'Sanskritization'. Redfield's concept has been of great heuristic importance for an analysis of the structure of the Indian civilization. Srinivas' concept opened a new approach to the study of social change and mobility in the Indian society. From the point of view of Indology and History the main merit of Srinivas' theory lies in the conceptual framework which helps to link research on the 'little communities' of india’s villages with the traditional field of Indology, the great all-India Sanskritic tradition. 'Sanskritization' thus became a helpful transmission belt between history-oriented and social anthropological research. It also helped to destroy the myth of india’s villages being an 'isolated whole' (Srinivas/Shah). But soon some disadvantages of these thought-provoking concepts became obvious. On the one hand, they still tended to distinguish too dichotomically the all-Indian great tradition from the little tradition of India's villages and, on the other hand, sometimes overemphasized the all-Indian Brahmanical model of Sanskritization in the context of social change in traditional India. A thorough reflection on, and critical analysis of, both concepts, therefore, led to their further conceptual development. The rather static concept of 'the great and the little tradition' has been modified by several new approaches and methods. Sociologists emphasized continuous processes of 'universalization' and 'parochialization' (MacKim Mariott) and an uninterrupted tribe-caste continuum (Bailey, Sinha) and accepted the all-Indian Brahmanical model of the society as the basis of the local and regional caste system (Dumont). Furthermore, problems of state formation were discussed by historians in the conceptual framework of 'nuclear area' of intensive Hinduization (Stein) and 'regional centres' (Rothermund). In tribal central India state formation has been linked with social change according to the Rajput model ('Rajputization', Sinha). The results of this study confirm the supposition that Sanskrit has never been the only medium through which Sanskritization developed and that its agents were not at all always Brahmins (Staal). Regional languages and regional variants . 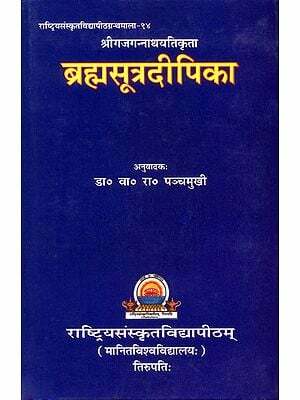 (desacara) of the pan-Indian Dharmasastra law books often played a much more important role in the process of Sanskritization. In this context, the problems of mutual influence of the various levels of Indian culture became a central subject for the analysis of its social organization. Questions of the networks and centres in the integration of Indian civilization (Cohn/Marriot), methods of popular instruction (V. Raghavan), and the channels of cultural transmission (Marriot) were thoroughly discussed. Other scholars emphasized in this context the role of sacred complexes (Vidyarthi, Jha) , e.g. places of pilgrimage and temple cities, of sacred specialist, e.g. 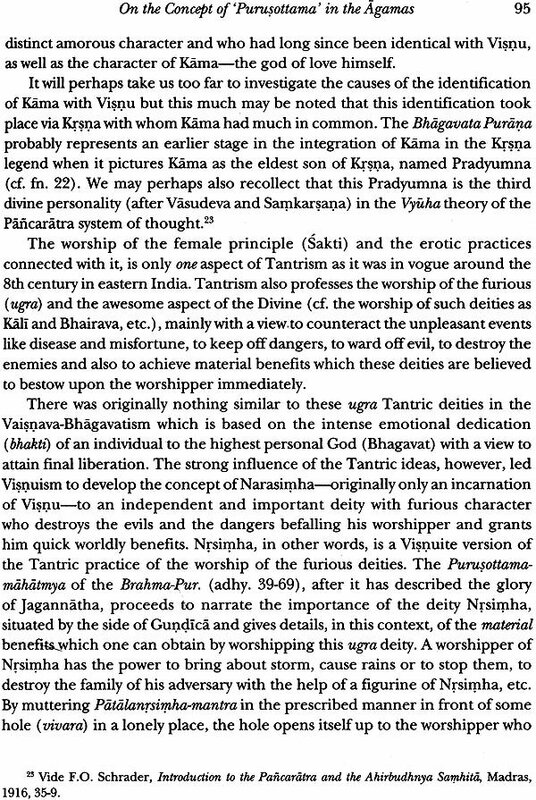 priests, mendicant samnysasins and pilgrim guides, and of sacred performances, e.g. Rama Lila or Radha Krsna bhajana (Singer) and termed pilgrimage as one of the main unifying forces in Hinduism (Ensink). It is this context in which the Orissa Research Project analysed in a comprehensive and interdisciplinary research scheme the 'sacred complex' of Puri in order to contribute to the knowledge about the origin, development, and organization of a regional cult and its role in the formation of one of india’s least known and yet most vivid regional traditions. Orissa, lying at the north eastern coast of the Bay of Bengal with a site of 60,172 square miles and a population of about 20 million (1971), provides an excellent field for the study of a regional tradition. With a fertile alluvial belt along its coast of 300 miles (between 17'48' and 22'34' north latitude), surrounded by semicircular rugged tracts, dotted with jungle-clad blue hills of the Eastern Ghats and broken by ravines. and deep valleys, Orissa, on the one hand, throughout its history formed a geographical unit with its distinct cultural and political history; on the other, it has three major geographical outlets which connected her with the neighbouring regions. The north eastern and southern influences met in Orissa via the sea-coast and it was also in direct contact with central and north India through the Mahanadi valley. 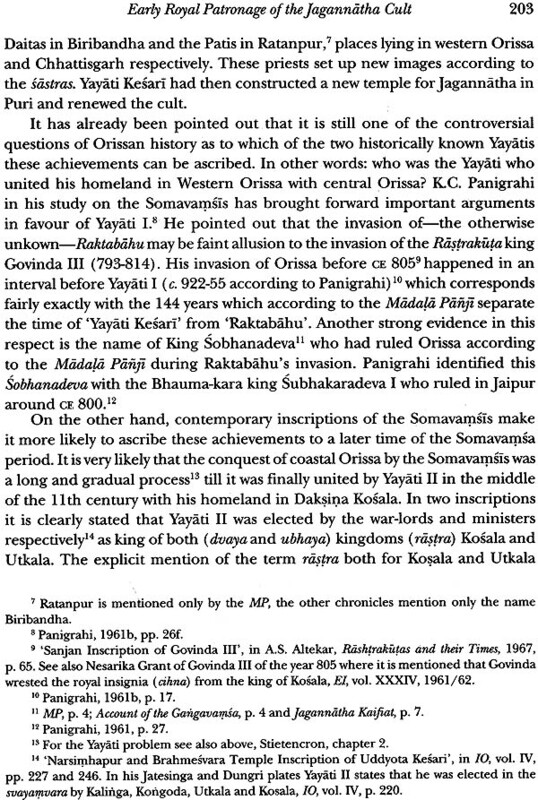 Although quite secluded, Orissa was thus not at all excluded from the developments outside its natural borders. A further advantage for a study of the regional tradition of Orissa is its rather unbroken cultural development. Perhaps due to its geographical location it was able to withstand the Muslim onslaught till 1568, more than three centuries longer than most other parts of north and central India. 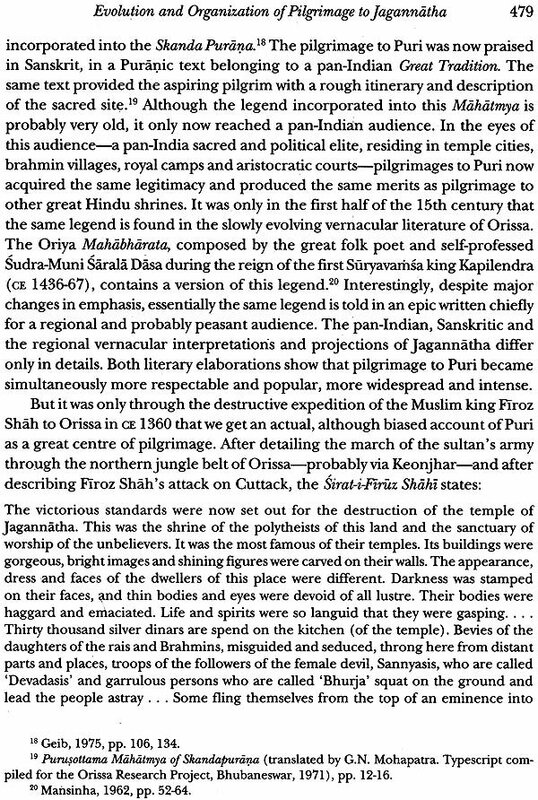 And even during the heyday of Muslim rule in India under the Mughals, the distance from Delhi allowed Orissa to preserve her traditions till 1803, when the British East India Company defeated the Marathas who had ruled Orissa since 1751.